Last weekend, I took the kayak for a paddle hoping to sneak up on a few tarpon near a mangrove shoreline. I didn't even see one. Later in the day, however, I rounded a rocky point on the way to a rendezvous at a sandy beach with some friends and spotted a dark mass huddled near the shoreline being pounded by small jacks and pompano. I beached the kayak and strung a new leader on my 10wt and started casting into the shadow. I hooked pompano and small jacks on every cast. They've got a lot of heart and I would have followed that baitball up and down the beach all day, but it was one big pull that really got my attention. I had heard rumors of bonefish at this beach when the swell is way down, and as soon as my backing knot ticked through the guides I knew that it wasn't a jack or pompano on the end of my line. In all of last year, I struggled mightily for bonefish action. Reading back on the blog will illuminate you if you haven't been following along. 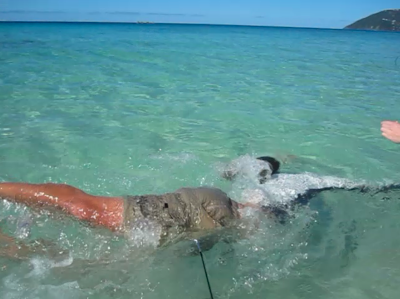 Between August 2009 and July 2010, I landed PRECISELY ONE BONEFISH. In my eyes it was an epic fail. When Mark and Adam came down for three weeks in August of 2010, the three of us teamed up for 10 bones brought to hand in 21 days of fishing dawn 'til midnight. Call it being at the right place at the right time. Call it finally being rewarded for the endless sun-scorched hours of searching the flats. Call it karma for the dues paid, or whatever. By the end of this day, I would land 4 nice bonefish and guide two friends who have never held a fly rod to 4 hook ups. It was an atypical day, to say the least. Friends helping with the landing. I landed the first bonefish by myself. Later, I met my friends and went for an awesome snorkel to some offshore rocks. On the way out, in three feet of water, a school of about 30 bones cruised through. I knew that as soon as I returned to shore I would have to take some casts at these fish if they were still around. I swam the 200 meters back to shore well before anyone else and spotted the school on the way back in, as well. I jogged up on the beach and rigged up at the beached kayak. On my first cast, a decent sized fish took the minnow imitation and streaked out towards my friends who were swimming back in. They saw the fish, then saw me. A buddy started chasing the fish and filming it with his underwater camera while I tried to haul it in. My friends gathered around as I put on a clinic on how exactly to not land a bonefish properly. I handed the rod to a friend who promptly dropped it in the water, then proceeded to pull in the fish by hand for the last 6ft or so of the leader. I went for the scoop, missed, and the fish popped off. I dove under the water and reached for it, but he got away before a hero shot could be snapped. Rightfully so. After that, I calmed down and started behaving myself. It was another great day. Too bad every single one of these photos has blur from water spots on the lens. Day two began with a major miscue. We took a chance on a much smaller tributary hoping to beat the crowds, and find our own little chunk of paradise. We arrived well before sunrise and took our time rigging up by headlamp and an emerging sun. After a hike into a ravine, we soon realized that we were not alone. Despite an empty parking lot, there were people and the majority of the best locations were taken. The ones that were open allowed us precious time to take a few casts. Before long, we were slowly constricted on either side by a strong case of "I don't care," if your already fishing here. We hiked out. Soon after, we were back to sight fishing for steelhead in a little game we called, destined to take. With the majority of the fish having symptoms of lockjaw, Adam and I had to pick our spots. This began by scouting out the shoreline from above and picking out the steelhead from the kings and atlantics causing a ruckus. After gaining a position slightly upstream, well placed casts were made to create dead drifting imitations down into the feeding lanes of the scouted steel. If a steelhead showed any interest at all in the fly, he/she was labeled: DTT. Those with lockjaw, or zero interest, were promptly left alone. The situation repeated itself for a few hours before we had to pack up and drive out. Adam scored multiple times with a rig of a single split shot, while I hooked up with no weight at all. A rare sight amidst the kerplunk's of heavily weighted rigs dragged down and across the bottom. The day ended with a take by the Queen DDT. A large fresh hen who after several attempts at a long weightless dead drift finally took the fly. Fifteen yards upstream, I promptly pulled the fly out of her mouth, the hook point pricking her enough for a brief head shake. After that, she was not DDT anymore. As I begin the first two hours of an eventual eighteen hours of driving over a day and a half, Jay Z's Empire State of Mind happens to come on the radio. It puts a smile on my face as I make my way north to waters filled with migratory salmonids. At stop number one, I am treated to a home cooked meal, two extremely happy dogs, and a quota of flies to tie at the vice. After a brief nap, Adam and I are loading up the truck at 1 a.m. getting ready to hit the road for the long haul. Sight Fishing Amongst Dozens of Liners. Early fall might be my favorite time to fish. The leaves are all starting to turn to hues of yellow, orange, red, and brown. The ground is littered with fallen leaves and all of this color is reflected on the surface of the water creating one large mirage. The weather is at the perfect temperature for anglers. A cold bite in the early morning and late evening interspersed with a warming sun and blue bird skies. Throw in a dash of salmon, steelhead, and the occasional brown trout and you have a recipe for a great day on the water. Took a UV Tube Fly. Adam Bringing in an Atlantic. The day of fishing is slow. As in all Great Lakes tributaries, the place is a circus, but we do our best. All these fish have been through a gauntlet of flies, bait, hooks, and ounces of lead careening through the air and water disturbing their feeding and spawning. Most of the fish completely shut it down, once the sun hits the water. But there are quite of few that continue to feed on chinook eggs dead drifting down the riverbed. Choosing a place of higher elevation you can pick and choose individual fish to drift too with the hopes that they will find your pattern appealing amongst hundreds of naturals and the many flies they have seen in their lifetimes. After a long work week, a long drive, and a long day of fishing we were quite tired but the fall scenary more than carried us on as the sun faded behind the tree line. As the other anglers headed off, Adam finally had some room to swing and lossed three massive Chinooks that exploded on his streamer. I eased into a favorite run for the first time of the day, and twenty yards below me my first brown of the season fell victim to a dead drifted egg pattern. The last fish of the day released, we hiked out to the truck and made our way to our five star sleeping quarters, ready for round number two in the Empire State. I Think We Need A Bigger Net.